I genuinely love Trebek and would gladly babysit his children for no pay. "It's not that I'm afraid to die, I just don't want to be there when it happens." But I didn't happen to catch the punctuation they used, so I started wondering how exactly it was written. "It's not that I'm afraid to die; I just don't want to be there when it happens." "It's not that I'm afraid to die. I just don't want to be there when it happens." So Googling didn't help, but it did give me the source of the quote. It turns out I have the book that it's from, which is "Without Feathers." 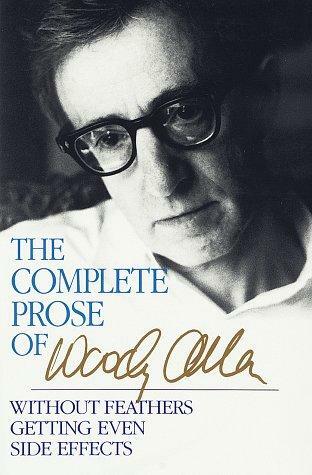 I used to own the book as a single volume, but I got rid of it when I received for Christmas one year "The Complete Prose of Woody Allen" wherein all of his three books (up until that point) were in one handy volume. Google didn't have a picture of the cover that was on MY copy. So I began looking for the story the quote was contained in...only to find...that the story (in this case, a play)...wasn't in the book. Now, the laws of physics, nature and ethics tell you that this shouldn't be the case. If a quote is in a book, then ipso facto it will be in YOUR copy of the book. I went through the table of contents several times secure in my faith that reality was not in fact falling apart at the seams. For a comedy trilogy he sure does look tame, what's that all about? My book was the complete PROSE of Woody Allen. Therefore any of those unworthy PLAYS were stripped out. So I reserved a REGULAR copy of the book from the library, had my sister pick it up and bring it to me (why not, she works there?! Sorry, it's just that my wife thinks I'm a bum for making her do that), and I finally got my hands on the quote. My sister. Also, what is this, a glamour shot by Deb? Now: I haven't told you this, but the reason why I was so curious is because I'm obsessed with dissecting language and grammar to figure out what makes things funny. And what makes funny things even funnier? My gut feeling is that going with a comma after the word "die" served to be the best punctuation to help deliver the highest funny. But obviously there are options there. You can break it into two sentences. But that's too much of a break, it doesn't flow enough and therefore subtracts some funny because of the lack of flow. You can go with the semicolon but I personally find that too academic and you end up lost in your head questioning whether or not that was a proper use of a semicolon (which is what you ALWAYS do every time you see a semicolon, at least if my experience holds true for the rest of humanity). I want this shirt. Bad. So that's my thought process, but would the master agree with me? It actually was a HUGE inconvenience to deliver the book to you, but being mentioned and pictured in your world-famous blog has swayed me to forgive this trespass. Plus, people who have never visited college writing centers would have no idea how to assemble this phrase correctly, so your receiving the book and consequently creating this blog was completely necessary.